Copa America get into its full groove on Saturday with three matches taking place starting with the early kickoff of Group A game between Paraguay and Costa Rica. The game will be played at Camping World Stadium in Orlando, Florida starting at around 05:00 p.m ET. USA takes on Colombia in the other game in the GROUP A which is widely regarded as group of death with all four teams capable enough to beat each other. Costa Rica is a team on the up if we consider their recent performances in major competitions. They surprised quite a few people with their resilient style of football in World Cup 2014 reaching the quarterfinals and cruelly beaten on penalties against Holland. 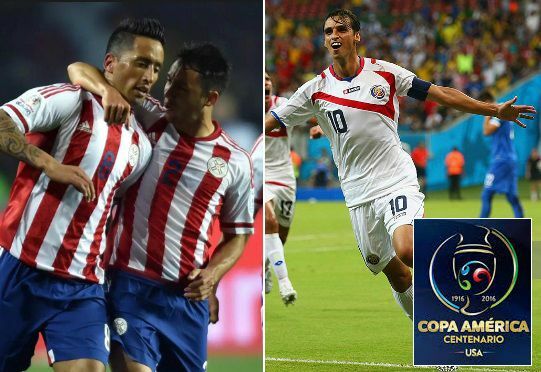 Paraguay on the other hand played some decent stuff in last year Copa America in Chile but they were humbled by Argentina in the semifinals by 6-1 scoreline. Team News & lineups: These two sides meet back in March 2015 for the friendly game and it turned out to be a lackluster 0-0 draw and we can expect the same on saturday as both teams put more emphasis on their defensive play. Paraguay do have some injury worries as three of the latest inclusions (Gustavo Gomez, Miguel Almiron and Victor Ayala) in the squad are set to go through fitness test. Costa Rica on the other hand will be without Oscar Ramirez who has been ruled out of the tournament after suffering a muscle strain during their 2-1 win over Venezuela in the friendly game. While champions league winning keeper Keylor Navas has also been withdrawn from the squad after Achilles injury. Match Predictions: It will be a very competitive game with Cost Rica starting with 5 man defense and Paraguay will find it hard to score against them. I am going with a 1-1 draw in this one as both teams might cancel each other out the way they are set to lineup.